As the world leader in hi-fi loudspeakers, Worthing-based B&W has been particularly adept at finding and/or creating niche-filling models at a wide variety of prices. The company has a dozen different series of models covering every conceivable price, size and style. The CM-series models are relatively recent arrivals on the scene, initially filling a gap between the vinyl-covered, budget-price 600-series and a more stylish and technically advanced CDM-NT Series, essentially by combining the engineering of the former with the real-wood veneer of the latter. Recently though, things have become rather more complicated. 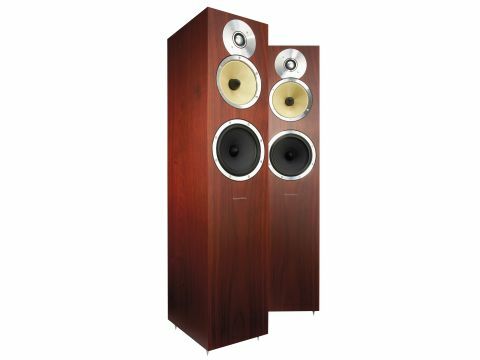 The mid-price CDM-NTs are no more, replaced by the 700-series and a wholly new slimline metal-jacket XT-series launched at around the same price. The two new latest introductions from B&W are in this intermediary CM-series; both sit in the gap between the 600s and the 700/XTs, but they're rather more than just prettied up 600s. They do have the attractive real wood finish, but they also borrow some of technologies from the 700/XTs. This was not particularly evident in the little two-way CM1 miniature, but it's far more obvious in this three-way floorstanding CM7. Although its £999 per pair price tag is substantial, this is also the first time that the company's radical FST midrange driver has been available at such a low price. This unique feature demands proper explanation. The FST (Fixed Suspension Transducer) is a special type of midrange driver, which B&W engineers originally pioneered in the much more upmarket Nautilus models. Its particular distinguishing factor is its replacement of the usual type of flexible surround attached to the edge of the cone diaphragm by a polymer ring. This ring is in contact with, but not physically attached to, the cone edge. The logic is impeccable. In the majority of three-way designs, the midrange driver is either the same as (or a scaled down version of) a bass driver. But the difference between a midrange-only drive unit and a driver required to produce bass (with or without midrange) is that a bass unit needs to allow significant fore'n'aft excursion, and this factor is quite unnecessary in a midrange-only driver. Whereas the multiple roles of the conventional rubber roll surround include centering the cone, absorbing edge-of-cone vibratio and permitting generous fore'n'aft excursion, by omitting the last of these, B&W engineers have designed a cone termination. This is specifically oriented towards optimising the vibration absorption characteristics, by using a heavy rubber gasket in place of the usual roll. The alleged consequence is a significant improvement in dynamic range resolution. The attractive sharp-edged cabinet, made in B&W's Danish factory, comes finished in wenge, rosenut or maple real-wood veneers. Our rosenut samples lacked any real grain and therefore weren't the most convincing, it must be said (but then neither is the concept of a rosenut tree). But the end result is at least marginally preferable to vinyl woodprint. To avoid lugs, magnets hidden beneath the veneer hold the fabric grille in place, and all three drivers are flush-mounted. Matching the shiny trim around the other two units, the tweeter's highly polished faceplate is partly cut away to allow it to be located as close to the midrange unit as possible. The tweeter is fitted conventionally into the front of the enclosure, not externally which is B&W's favoured approach, but it does use an internal Nautilus-style rear loading tube. The 25mm alloy dome gives output right up to 50kHz and also has a low enough resonance to allow a first-order, single capacitor network. Helping to keep the cabinet slim, the CM7's FST midrange driver is smaller than the versions used in B&W's more upmarket models, though its Kevlar cone still has the same 120mm diameter as the paper cone used in the nominally larger bass unit. Twin terminal pairs offer the bi-wire/bi-amp option, and a generous flared Flowport at the rear reflex-loads the enclosure. A hollow foam port sleeve offers an interesting port tuning option. Floor coupling is achieved via 6mm spikes (with a rubber foot option), and these fit directly into the base. While the speaker feels stable enough, one can't help feeling that a separate plinth, for aesthetic as well as stability reasons, ought to be part of a £1,000 package. Work started with the speakers located clear of walls, and connected up to a system using a Naim CDS 555 CD player, Rega P9/Naim ARO/Rega Apheta record player, Magnum Dynalab MD106T FM tuner and Naim NAC552/NAP 500 amplification, plus Vertex AQ and Naim cables. Having spent the previous day listening to a pair of B&W's massive and costly 800Ds, it was hardly surprising that the first impression of the CM7 was a little disappointing. This much more modest model lacks the scale, authority and also the subtlety of its big brother - but such a comparison is distinctly unfair, given the 13:1 difference in price. A few hours acclimatisation usually allows one to adjust to the inevitable shifts in tonal balance that occurs when changing speakers. But by the following day, the CM7s still weren't getting this reviewer excited. The top end seemed sweet and encouraging enough, but the music as a whole was sounding thick. The in-room measurements provided the clue, as the whole bass region, especially around the 45Hz port-tuning frequency, was clearly dominant over the midband. Happily, the solution - inserting those hollow bungs - turned out to be simplicity itself. These not only damp the port output somewhat, they also shift its tuned frequency downward to around 30Hz. This has a dramatic effect on both the measured and the perceived tonal balance of the speaker, and the effect is totally positive. The complete removal of that bass heaviness and thickening immediately brought a natural tonality to orchestral music, and made it much easier to hear the impressive qualities of that special midrange driver. Male voices no longer had a thick and chesty quality and the speaker as a whole seemed altogether more transparent, with much improved stereo image perspectives. Initial fears that B&W had got this one wrong were entirely laid at rest. The CM7 has its limitations, for sure. But that's true of any £1,000 loudspeaker... otherwise there'd be no sense in making an 800D. The CM7 falls short of ultimate performance, but the crucial point is that it does so evenly, and delivers a well balanced all-round performance in every respect. One might wish for more of the dynamic drama and smoothness that larger and more costly speakers provide. But you'll be wishing for the same from any speaker at the CM7's price. At the same time, the CM7 offers clear advantages over smaller two-way designs, through the delicacy of its mid and top end, and a bass delivery that's deep and crisp and even. Indeed, with bungs in place the bass extension is a creditable 24Hz for -6dB under our in-room far-field conditions, alongside decent 88dB sensitivity, even if the load has a four-ohm minimum at 140Hz.